The Minox Classic Collection from Minox was launched in 2000 with the one-third scale Leica IIIf originally at 899DEM (299GBP in England) but was heavily discounted in 2003 with many retailers selling for under one third the manufacturer's suggested price. For those who had already purchased three or four of the range the instant devaluation of their collection was 800GBP (about 1100EUR). 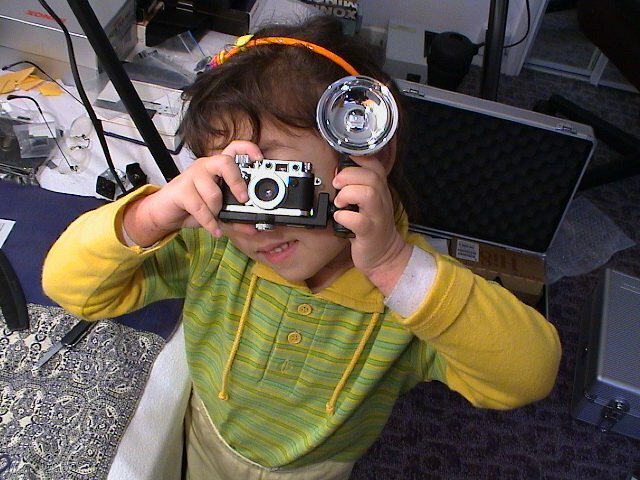 The accessories for this camera included lens cap and leather neck strap. Both of which are included without additional cost with the Sharan Megahouse Leica IIIf. The Minox Leica IIIf lens cap however is made of metal, not plastic. 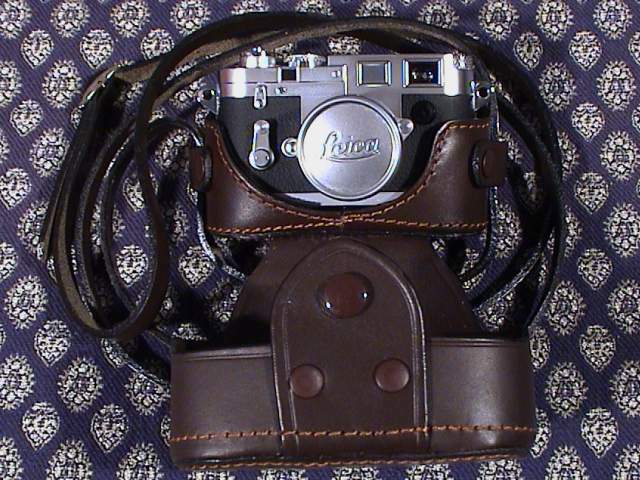 The high quality leather case (above with Minox Leica M3) was offered for 234DEM (119EUR). Unlike the cameras the accessories where no discounted and so the case was being offered for 20EUR less than the camera. The cameras has a small bore tripod socket. Sharan sold the tripod to be used for display purposes, not for use in photographing objects as no cable or remote release is provided with any of the models. The cases use small thumb wheel screws to lock the camera to the bottom of the case. Gold contacts for the electronic flash are on the base of the camera. These are proprietary and Minox sold a special strobe to fit the Leica IIIf which has a screw to lock the camera into place. A standard PC socket, so that any flash unit could be operated with the camera, and a standard 1/4" tripod socket would have cost very little more. The flash unit is functionally very good with a large reflector and fast recycling time. In keeping with Minox tradition (although this is most likely a Japanese design as well as Japanese production) of huge flash units to tiny cameras the Classic flash also belittles the Minox Leica IIIf camera. For a flash unit costing 119EUR it might have been expect to also have a rotating head to bounce flash The flash is very bright to allow the 1/250th to get enough light but over exposes the Minox digital Leica M3 2.1/3/4Mp. Yasmin, aged 5 comment on this arrangement was "It looks silly".